Decoration : 8 furniture transformations that you will love! 8 furniture transformations that you will love! It's economical and it's beautiful! Do you have furniture at home that looks old and useless! Well this article could make you change your mind! 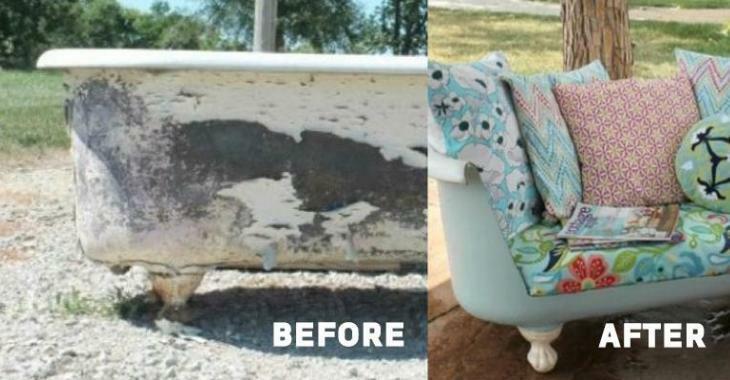 Here are some owners who have decided to turn their old furniture into something beautiful! Here is a bench that looks very comfortable, but which would need a small transformation! Here are two wonderful ways to transform this bench that is a bit old fashioned! You just need to paint the structure and cover the cushion! A real transformation! Do not know what to do with your old headboard? Do not think about throwing it away! On the contrary, think of recycling it into something more useful! By combining the headboard and the foot of the bed, here is what you can get: a bench! And again, it is possible to customize it according to your taste! Really great! This old piano was surely used to make some wonderful music in the past, but I think it's not the case today! Look how it was transformed today! Well why not turn it into a beautiful bar? That's what this piano owner did! What a great idea! I think you will agree with me! This old buffet would need a new life! What a beautiful way to hide a radiator! By transforming the buffet, they removed the base by keeping the top to make a storage! It's really beautiful! What do you think? You will see that this transformation is really original! This bathtub was unusable! See what the owners have done! Yes, they turned the bathtub into a beautiful retro style sofa! Isn't it amazing? Here's what the owners have done: a buffet for the kitchen! They only had to change the windows of the furniture and paint it! It's really very pretty! Your old bedroom furniture could be used for something else! Look at the next picture! Yes, you guessed it, they transformed the furniture of their room into a beautiful vanity! What a great idea! Here is another wardrobe that needs a little transformation! Look what the owners have done! They have indeed transformed it into a beautiful office! It's so good!